Lugarno Collection has created a travel package that allows guests to discover the many lavish aspects of the Florentine lifestyle. 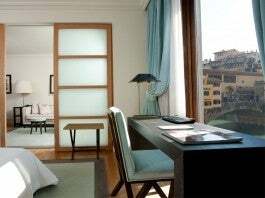 Lugarno Collection is offering suite guests of Hotel Lugrano, GALLERY Hotel Art, Lugrano Suites and Hotel Continentale the ability to enjoy lavish and beautiful accommodations and dining steps away from the Arno River in Florence while also experiencing first-hand making of the Brunello di Montalcino. Guests can stay in one of the seven signature suites within the beautiful city of Florence for three nights. Travelers will then partake in the Montalcino Wine Experience at the famed Castiglion del Bosco Winery in Tuscany. The experience begins with transfer from Florence into the breathtaking mountains of Tuscany and finally to the winery. This experience also includes a guided tour of the winery which incorporates an intensive wine tasting, including the exclusive Brunello di Montalcino and four more rich Italian wines. To finish an incredible Tuscan experience guests will be treated to a five-course lunch at Osteria Canonica. Once back in Florence, guests are treated to a visit to the Salvatore Ferragamo Museum. Here there is a chance to learn the history of the famed shoemaker. After a day of sights, it’s time for a gourmet dinner for two at the Borgo San Jacopo Ristorante at Hotel Lungarno, complete with five courses and wine pairings selected by the Sommelier. To top it off this incredible package includes a daily breakfast buffet, early check in at 10 am and late check out at 1pm. Packages rates start from approximately $4,328, per double occupancy. Minimum stay is three nights.